Percy and Florence Arrowsmith, who celebrated their 80th wedding anniversary Wednesday, say the secrets of the world's longest marriage are don't sleep on an argument, always share a kiss and hold hands before going to bed. Percy Arrowsmith, 105, and his 100-year-old wife were married on June 1, 1925. They met at their church in Hereford in western England, where he sang in the choir and she was a Sunday school teacher. Queen Elizabeth II sent her congratulations to the Arrowsmiths, who celebrated their anniversary at home with coffee and snacks and with family and friends. "What a splendid achievement. I send you my warm congratulations and best wishes for your 80th wedding anniversary," the Queen's card said. The Arrowsmiths, who have three children, six grandchildren and nine great grandchildren, claim the key to their long marriage is not to go to sleep on an argument. They say they always kiss each other and hold hands each night before going to bed. "He can't settle down if I'm not holding his hand," Florence Arrowsmith was quoted as saying last month. The couple's daughter Jane Woolley said her parents were both "very perky." "She says she can't dance any longer but it feels good to have been married for 80 years," Woolley said. "She says she can still have a drink." 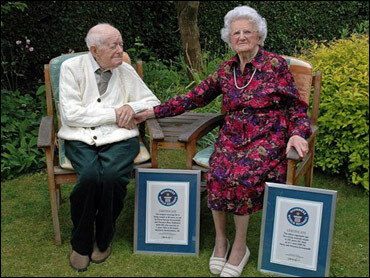 Guinness World Records said the pair held records for the longest marriage for a living couple and the oldest aggregate age of a married couple.